PdfGrabber is the professional PDF converter software for Windows and Mac. Export your documents into all important Office formats: Word, Excel, DXF/AutoCAD, JPEG, PowerPoint, HTML, eBook and many more. Export the images contained into numerous graphics formats or convert entire pages into an image. Conversion with PdfGrabber also works without Adobe Acrobat. Try it for yourself. 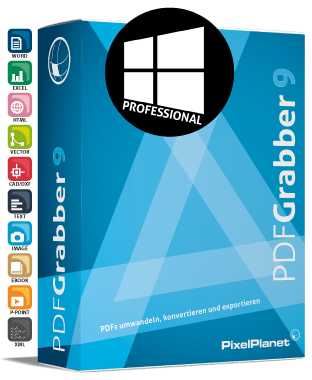 PdfGrabber opens up a range of new possibilities for processing PDF files. 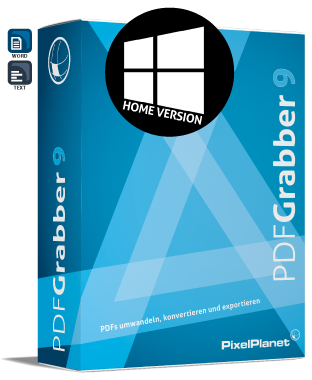 Rather than having to accept the restrictions associated with this format, PdfGrabber enables simple conversion into a range of other file formats. Edit PDF content in Microsoft Word, Excel and PowerPoint. Export technical drawings to your CAD program, save complete documents for archiving as TIFF or extract all the images contained, for example, as JPEG files. Do you want to integrate PDFs into your website? Or read these on your iPad? With the PdfGrabber this, too, is no problem thanks to conversion to HTML and the eBook format ePUB. For professional users, PdfGrabber enables export to ASCII-Text and XML as well as various other automation options, such as the creation of export profiles, monitoring of folders and control via the command line. 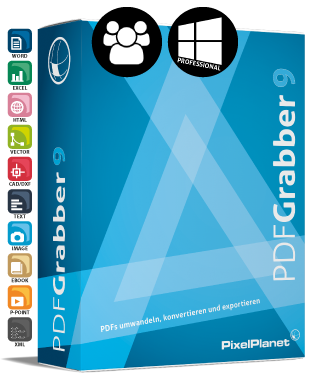 The trial version includes all the features of PdfGrabber Professional, but it randomly adds ‘Xs’ to the exported texts. Graphics and images are watermarked. CAD drawings are 2/3 exported. Naturally, these restrictions no longer apply upon activation of the full version.